I have to give it to the NYC fashionista. It's hard to be running around the city in full gear, make-up, and hair walking the longest blocks ever known to man. A southern girl has it easy, because all we do is get in our cars, find the closest parking space, then get out. In New York your walking the streets, going up and down stairs....oh the humanity! I swear I walked 20 miles, but my workout conditioning had me feeling a lot better this go round. Needless to say, I went in NYC with outfits prepared, but had to rework all of my looks to provide me with easier mobility and comfort. I ended up wearing back up pieces instead of my planned pieces. Literally around every corner there was fashion. I was getting off the train and ran into the Style Network and the "How do I look" host, Jeannie. It was a small crowd, so I decided to takes some pics for the blog and was asked to participate in their Pop Up Style segment. Of course I said yes! The next day, I get a tweet saying that they saw me on the style network. Please note that Jeannie is just as adorable in person as she is on TV. This moment was probably the most coolest random moment of my life. Proving that you should always look your best, because you never know what's around the corner. See the commercial below shot guerrilla style on my T.V. ~ Don't judge me. Friday I also got to have a late lunch with fellow author of Counter Girls (which is a story about make up artists and their juicy lives), Felicia York. She's a MAC make-up artist at the Big Macys in NYC with stories to tell. I'm intrigued and can't wait to read. My own sheer nosiness has me rubbing my hands together. And then I had dinner with fellow blogger and new fashion editor to Plus Model Magazine, Alissa from Stylish Curves. 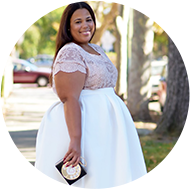 I really enjoyed her blog on the H&M plus size section and I even had a chance to take a look at it with her! The plus size collection is here in Dallas as well, but I heard it was so bad that I never even took the time to look. The fit is bad, there were a couple of cute pieces, but the fit was so bad that I couldn't work with them. Anyways, it was so nice to actually get a moment to chat with these girls. I've met Alyssa several times, but it was always in some kind of event setting, so getting a chance to sit and chat about fashion was great. My last day blog post in NYC is coming up so stay tuned. Thank you!!! I def. plan on trying to go every year. So freaking cute!! You look amazing hun!! Such a cute outfit. I absolutely love the skirt and your cute shoes. Congrats on being featured on the Style Network. I remember for a few years our cable company didn't feature the Style Channel. Dark days. I know!!!! I love the style network! I judge you to be FABULOUS! Shoe envy.. BIG TIME!!!!! Love this outfit to pieces!!! Yes, my dear, I had a good ole time with you. Right, right! LOL!